In the quest to become a winning poker player, it is of utmost importance that you manage your bankroll well. While the theme of aintluck.com is that “when it comes to winning poker, it Ain’t luck,” I don’t want to make the ridiculous statement that luck is not a big part of poker. While, I believe that the effect of luck is huge in poker, it can be outweighed with proper knowledge of the game your playing, experience at the tables, and of also, Proper Bankroll Management. You may be wondering, “How does Luck in Poker correlate with Bankroll Management?” The answer is because of luck and fluctuation at the tables, no matter how perfect you play, your bankroll or chip stack will consistently fluctuate up and down. Basically, you want to prevent the downward fluctuation from zeroing out your bankroll. Consistent correct play at the tables will make your bankroll go up consistently, however, your bankroll has to be able to support the natural luck and fluctuation in the game. Don’t sit down at a stake level without being able to sit down with at least 75 - 100 times the Big Blind. This gives you a reasonable chance to recover from short term slumps, whether its because of bad cards, or simply bad beats. There will be short term slumps. It’s part of the game. Don’t exceed committing 30% of your total bankroll at one table. I recommend 20% but certainly no more than 30%. If you wish to be extra careful then 10% is a very safe figure. Tournament entry fees should be even lower. As an example if you are considering sitting at a $0.25 / $0.50 Limit Texas Hold’em game then you should sit down with a minimum of $37 to $50 and have a total bankroll of around $175 as the money you are sitting down with ($37) represents 20% of your bankroll. Most players don’t adhere at all to bank roll management, so it will give you a more intimidating presence at your table. 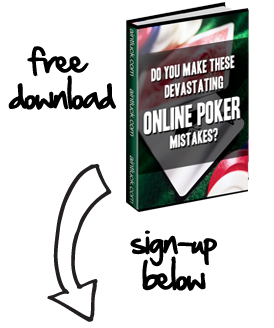 You may be thinking “if most players don’t do it, then why should I?” Well, the truth is that most players, are losing poker players. The basic point of this article is to help you with guidelines for proper poker bankroll management. Winning poker is something that happens over an extended period of time. Also realize that, particularly in online poker, winning isn’t limited to the amount of money you can see in your cashier’s box. Extended play will not only allow you to manually build your bankroll, online poker rooms have competitive loyalty programs that will further build your bankroll with comps and player rewards. This includes passes to big prize pool tournament entries, freerolls, products, and sometimes, such as at a room like Absolute Poker, you can trade your comp points in for cash. For example, a player at VIP Elite level who has racked up 200,000 comp points, can trade them in for $3,000 dollars in cold hard cash. So be encouraged, poker bankroll management is essential to winning the game of poker. Bankroll management gives you longevity and supplements your correct play to keep your bankroll at an incline. These online poker rooms are highly competitive for your play, and have loyalty programs that will nicely reward your solid and consistent play.